Adenoid cystic carcinoma of the buccal mucosa has an increased propensity for recurrence and distant metastases. Due to the poor prognosis at late detection of distant metastases, it is advisable to keep a close follow-up. 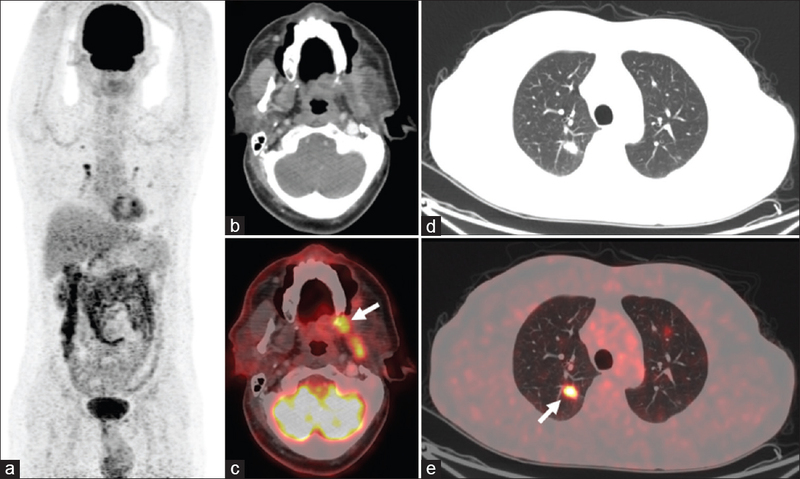 In the present case, 18F-fluorodeoxyglucose positron emission tomography/computed tomography proved invaluable in the comprehensive workup of the patient, including detection of local recurrence, distant metastases, and in assessing treatment response. A 54-year-old male presented with pain in the left cheek for 2 months. Five years back, he had undergone wide local excision with left segmental mandibulectomy and lymph nodal dissection, followed by radiotherapy for carcinoma of the left buccal mucosa, which revealed adenoid cystic carcinoma (ACC) in postoperative histopathology. In view of this past history,18 F-fluorodeoxyglucose positron emission tomography/computed tomography (18 F-FDG PET/CT) was performed for recurrence evaluation. 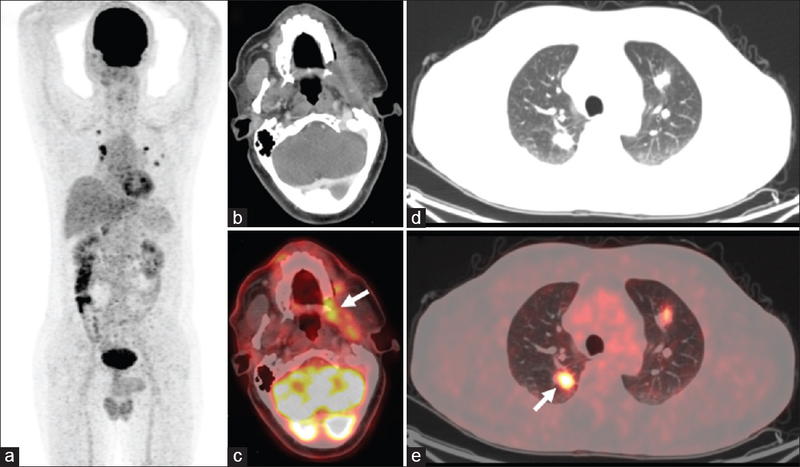 Maximum-intensity projection [Figure 1]a, transaxial CT, and fused PET/CT images revealed FDG-avid lesion in the region of left retromolar trigone [arrow; [Figure 1]b and c; SUVmax 9.3] and buccal mucosa, eroding the adjoining alveolar plate and involving the left lateral pterygoid muscle. Multiple FDG-avid parenchymal nodules [arrow; [Figure 1]d and [Figure 1]e; SUVmax 11.6] were also noted in bilateral lung fields. 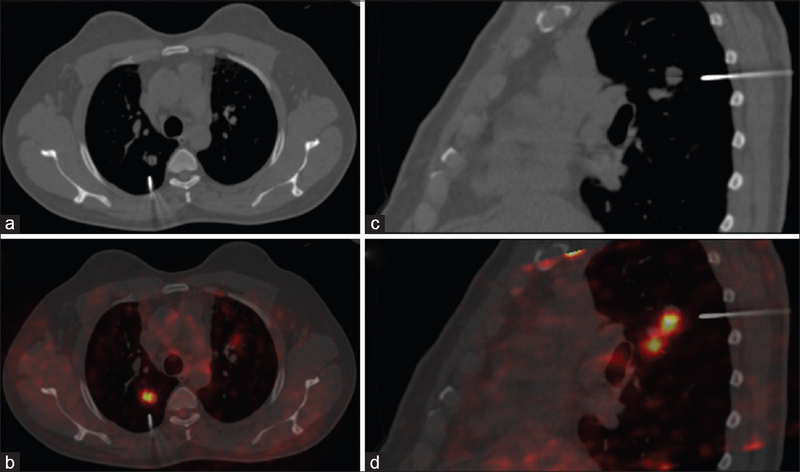 With suspicion of pulmonary metastasis, the patient was scheduled for 18 F-FDG PET/CT-guided biopsy from the parenchymal nodule in the right lung. With the patient in prone position, the nodule with the maximum FDG uptake was selected for performing needle biopsy. Transaxial [Figure 2]a and [Figure 2]b and sagittal [Figure 2]c and [Figure 2]d CT and fused PET/CT images confirmed the correct positioning of the needle. Histopathology of the biopsy specimen confirmed metastatic ACC. The patient was treated with chemoradiation for 6 months and scheduled for 18 F-FDG PET/CT, 4 months later for response evaluation. Maximum-intensity projection [Figure 3]a, transaxial CT, and fused PET/CT images revealed FDG-avid lesion in the region of left retromolar trigone [arrow; [Figure 3]b and c; SUVmax 9.5] and buccal mucosa with no significant change from the previous study. Multiple FDG-avid parenchymal- and pleural-based nodules [arrow; [Figure 3]d and [Figure 3]e; SUVmax 42.1] were noted in the bilateral lung fields with increase in FDG avidity, size, and number compared to the previous study, suggesting disease progression. The patient refused further treatment and was lost to follow-up. ACC is a malignant neoplasm developing more commonly in minor (~60%) than major salivary glands (~40%). The disease often has an indolent course with multiple episodes of recurrence and distant metastases, commonly to the lung and bones, as a late occurrence. ACCs have been typically characterized as low grade-to-non-FDG avid tumors, reported as false negative on 18 F-FDG PET/CT., Later, various reports demonstrated the role of 18 F-FDG PET/CT in evaluating disease recurrence and identification of distant metastases in ACC, thus affecting patient management., In comparison with magnetic resonance imaging,18 F-FDG PET/CT showed superior sensitivity for detection of local tumor recurrence and regional and distant metastases. Due to the inherent aggressive nature of the primary neoplasm, distant metastases in most patients is inevitable, even after being treated with curative intent, leading to poor prognosis., The present case illustrates the holistic role of 18 F-FDG PET/CT in the entire workup of the patient including identification of local tumor recurrence and distant lung metastases, in their histopathological confirmation by guided biopsy, and in assessing treatment response evaluation. Stell PM. Adenoid cystic carcinoma. Clin Otolaryngol Allied Sci 1986;11:267-91. Purohit BS, Ailianou A, Dulguerov N, Becker CD, Ratib O, Becker M, et al. FDG-PET/CT pitfalls in oncological head and neck imaging. Insights Imaging 2014;5:585-602. Roh JL, Ryu CH, Choi SH, Kim JS, Lee JH, Cho KJ, et al. Clinical utility of 18F-FDG PET for patients with salivary gland malignancies. J Nucl Med 2007;48:240-6. Bhagat N, Zuckier LS, Hameed M, Cathcart C, Baredes S, Ghesani NV, et al. Detection of recurrent adenoid cystic carcinoma with PET-CT. Clin Nucl Med 2007;32:574-7. Otsuka H, Graham MM, Kogame M, Nishitani H. The impact of FDG-PET in the management of patients with salivary gland malignancy. Ann Nucl Med 2005;19:691-4. Ruhlmann V, Poeppel TD, Veit J, Nagarajah J, Umutlu L, Hoffmann TK, et al. Diagnostic accuracy of 18F-FDG PET/CT and MR imaging in patients with adenoid cystic carcinoma. BMC Cancer 2017;17:887. Ko YH, Lee MA, Hong YS, Lee KS, Jung CK, Kim YS, et al. Prognostic factors affecting the clinical outcome of adenoid cystic carcinoma of the head and neck. Jpn J Clin Oncol 2007;37:805-11. Bobbio A, Copelli C, Ampollini L, Bianchi B, Carbognani P, Bettati S, et al. Lung metastasis resection of adenoid cystic carcinoma of salivary glands. Eur J Cardiothorac Surg 2008;33:790-3.